Not to bad from Errol. Big and wide. Hangs over my o scale flat bed rail car but looks great chained down on it going around the layout. Be careful with tracks they break off relitively easy. Very nice and well made model. Had had no issues out of the tracks or cylinders what so ever. Will recommend to any collector or kid. I love it! I havent had any problems. Ertl models look great and their price is a lot less than their competitors. But the quality of the models cylinders is trash! Use caution when extending the cylinders because they can break without warning where they are connected, basically ruining the model. This is not from "playing or misuse of the model". They just break for no reason. Save your money and buy a better quality model from Norscot or NZG. I hope 3000 Toys posts this because this is the truth. Not a good model. I take it out see if its tracks move and the track breaks. I think that it is a good model but they could have used less plastic. I like the digging depth and I like the tracks. But I don't like how far the bucket curls out. Nice model, better than the previous 450DLC. Bigger too, and looks good with other Deere models. Unfortunately, the are a few parts reused from the 450. Very great model. It is the exact same as the Hitachi Zaxis 450 Lc. I have it also, and both are great models. The tracks broke but fixed them with super glue. Great model - I recommend it. nice but my model brook. I GOT VERY MAD!!!!!!!!!!!!!!!!!!!!!!!!!!!!!!! I am not pleased with ERTL. It is a nice model it has a nice large bucket. And it has a nice thang to the depth of the boom. I had this model for three months on the shelf, I went to move it another shelf and the tracks fell off. I would say this model should only be $25.00 and not $51.00 for lack of detail and loose parts that fall off. Very nice model. The only reason I give it a 4 is that the stick does not go out all the way, and I would have expected a larger bucket. Otherwise it's a very nice model. 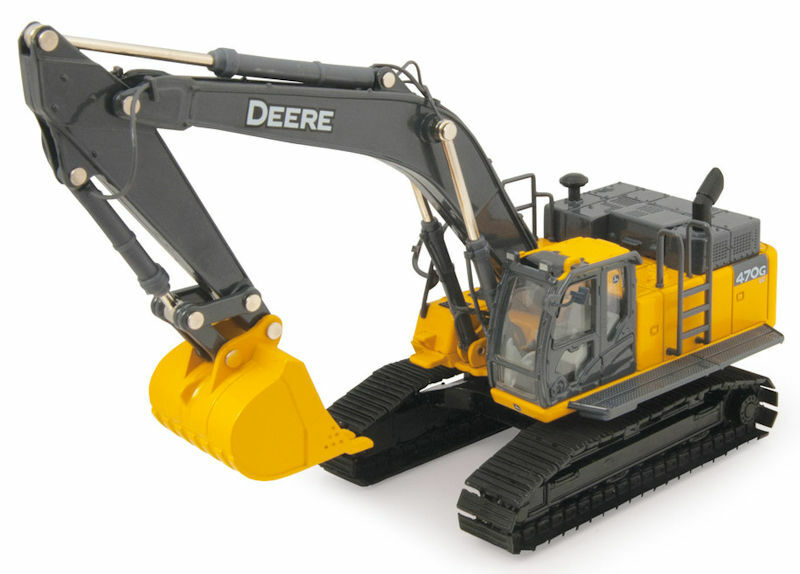 Extremely nice model great detail, Tracks roll nice hydraulics move nice also, Overall great model. Extremely nice model just got it in the mail, Lots of great detail. verry good model highly detailed!!! ertl did a great job but... i had the model for 2 days and it fell off my shelf when i went to take it down and the boom broke so i used it for parts and a took the tracks off and put them on my case verrry gooooooood model!!!!! I would have to say I very pleased with this new John Deere Model, But would have liked to see a bigger bucket compared to the 450 LCD previous model. Other than that this a great piece to my collection. Excellent model,It has very good detail. The tracks, Body, Boom, and bucket move very nicely. I am very pleased with ERTL. It broke before I got it got home. Awesome model!!!! I got a proto type from the Deere dealership! It is so cool! !